Have I recommended the Somm documentaries to you? Oh, I've told you five times? Yeah, sorry about that. No, Netflix isn't paying me. (I wish.) I genuinely enjoy them so much! The emotions, the stories, the wine. Just watch them, ok? Needless to say, I'm anxiously awaiting the third installment! 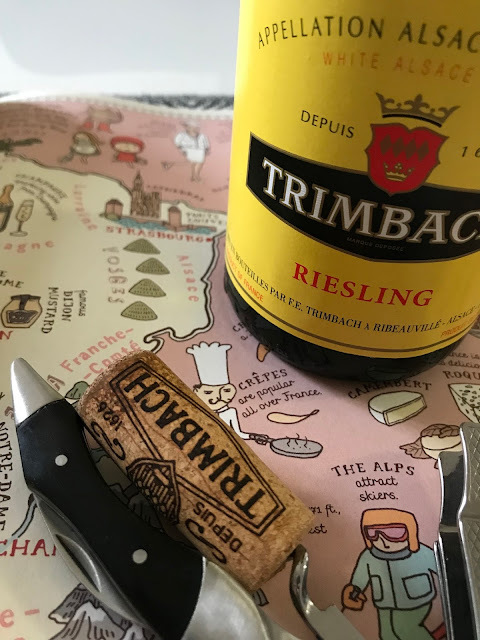 In the meantime, I enjoy sipping some of the wines that are mentioned in the films, including my favorite Riesling from Trimbach Estate in Alsace, France. Want to know the real reason I picked this for April? Because I'm a little obsessed with it. Seriously, I have a ton of wine in my apartment but last weekend I ran to the store because all I wanted was another bottle of this. I'm even considering calling it my favorite bottle of white wine. It is hard for me to pick favorites but damn, this wine! But let me rewind a little and give you some information on the producer. Trimbach has been making wine in Alsace since 1626, so these folks know what they are doing. If something is older than the United States, I can almost guarantee I am interested in it. Currently, the estate is run by the 11th and 12th generations, with 13th generation Anne Trimbach preparing to take the reigns. While the notes below are on their classic Riesling, it would be rude to not mention their "Clos Sainte Hune" vineyard to you. It is their crown jewel and a bucket-list wine for many, including me. It is within reach at about $150-200 but certainly not an everyday bottle. If you splurge on it, remember to invite your favorite wine blogger over for a glass! 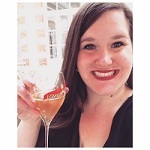 Check out the wine of the month archive here! Well, I already gave away the fact that I love this wine, so let's just get to it! Overall, the 2014 vintage is a crisp, zesty Riesling made in a dry style. It reminds me of a bright, beautiful country table strewn with crunchy yellow apples, new apricots, fresh lemons, and a bouquet of white flowers. At the end, there's an unexpected but welcome touch of spicy ginger! It is elegant, well balanced, and downright delicious. While I remember a hint of Riesling's telltale petrol on the 2013 vintage, I was not picking up any of it here. I personally don't mind a little gasoline on my Riesling, but I have to say I liked the 2014 vintage better without it. Next: Skip the takeout and pair your Riesling with stir-fry!